Here I have the second part of my skincare week! Unlike my quick & simple morning routine, for me the focus is definitely in the evening, because it's 10 mins to myself, after a busy day filled with toddler & household things. So I actually enjoy spending a little more time on my skin compared to the morning routine. 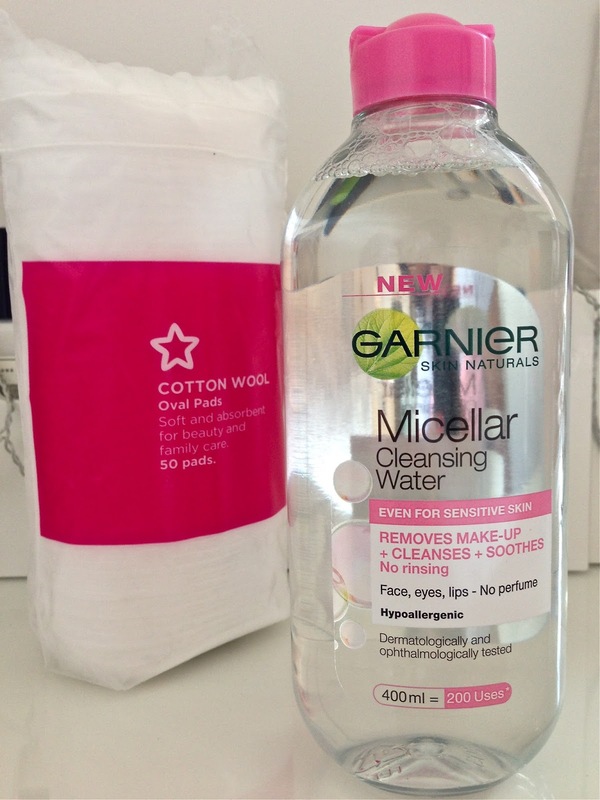 If I've been wearing makeup during the day, I like to start by taking my eye makeup off first with the Garnier Micellar Water. I can't rave about this product enough; it's great and super affordable. There's no need to rub or tug away at the sensitive eye are, because this stuff removes eye makeup so effortlessly. I like to use the bigger oval cotton pads (one for each eye) and the job is done within minutes. This is usually found on special offers in most stores and the bottle lasts a long time, so I definitely recommend it. 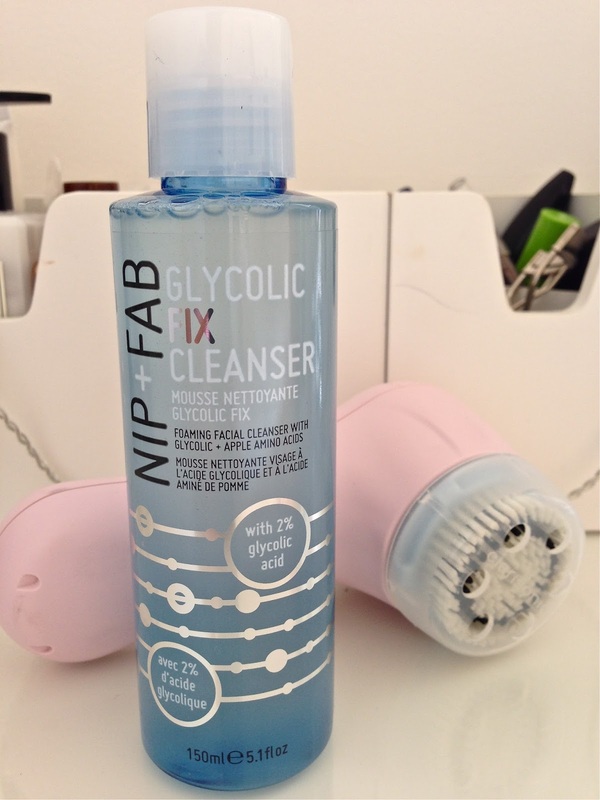 If I've been sporting a bare face, I just go straight ahead with the Nip + Fab Glycolic Fix Cleanser and my Clarisonic Mia 2, getting rid of all the grime & dirt build throughout the day. I like to make sure that the Clarasonic brush head and my face are both wet (using semi-hot water so my pores open up for a good clean), before I start the cleansing process, otherwise it's way too harsh for my face. I like to squeeze a little bit of the cleanser straight onto the brush head and work from there, but that's only a personal choice (you can also apply the cleanser directly to your face and then get the Clarisonic to work; that's up to you). I have been using the Clarisonic since January and I really enjoy the deep cleanse it gives, leaving my skin super soft. It's not a miracle for banning blemishes or spots by any means, but I still enjoy using it as I haven't experienced flaky skin since I started. The cleanser is totally new to me, in fact the whole Nip + Fab brand is one I've never tried before and had a tendency to overlook in stores. But this time something about it caught my attention probably the "glycolic fix" part of it, as I've been reading that it's a good exfoliator which also helps restore the skin's natural balance. I figured this would be perfect for my combination skin and so far I'm really enjoying using it. 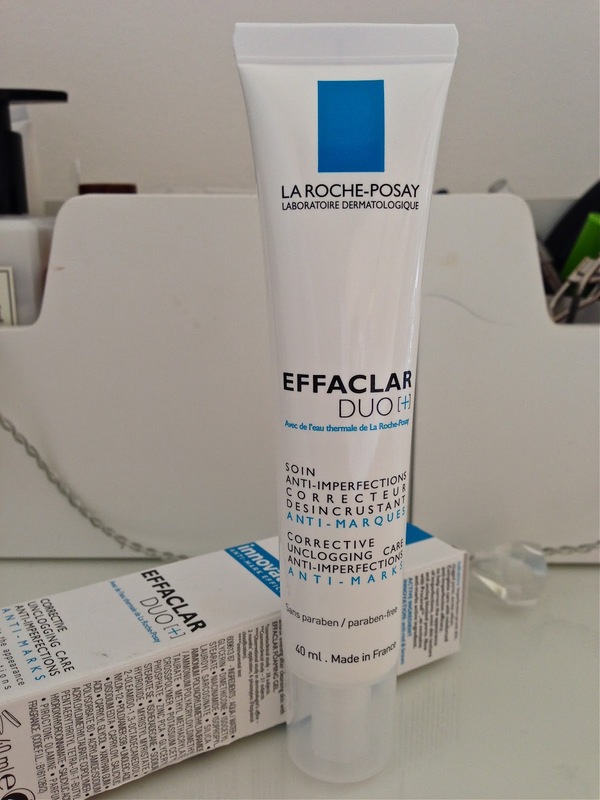 Next step is applying the La Roche-Posay Effaclar Duo+ which again is a totally new product to me. 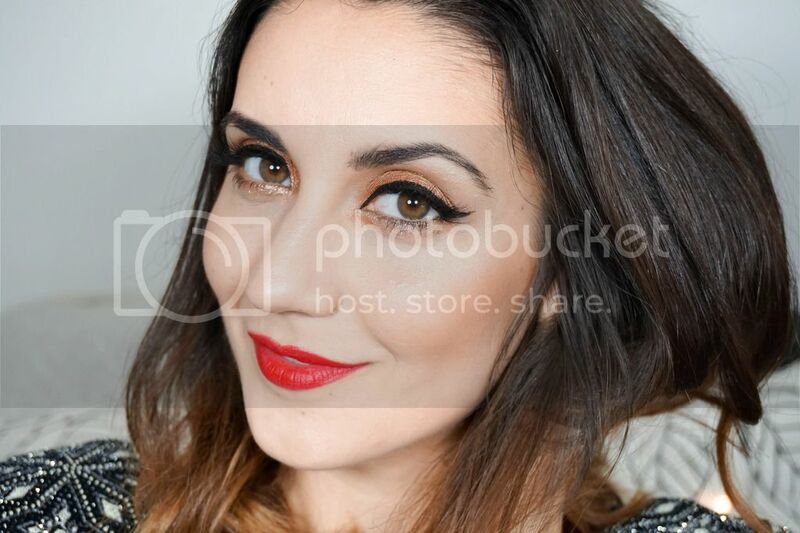 This has been around for a good while now and has a good reputation amongst the blogging community, but I've never been tempted by it until recently when blemishes became problem. I apply a pea size amount of this to my problem areas such as my forehead, down my nose and onto the chin. I can honestly say that I've noticed a difference in the amount of pesky little spots that I used to have to deal with. They have definitely decreased and that a big thumbs up in my books. This will most likely be a repurchase for me from now on. Last step in the routine is focused towards the dryer areas of my face, mainly my cheeks. 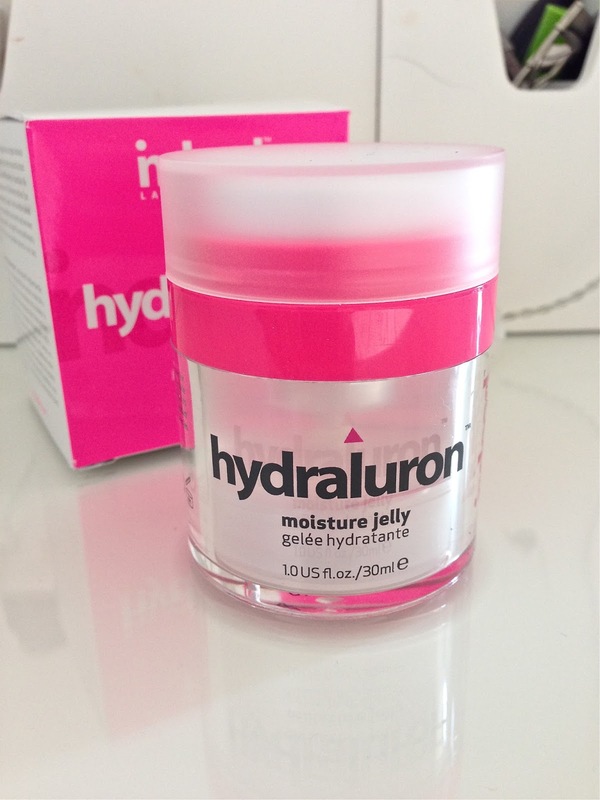 I opted for Indeed Labs Hydraluron Moisture Jelly because the Hydraluron range has been receiving amazing reviews and I was intrigued to see what all the hype was about. I was also clearly attracted by the packaging, the lid with a build in pump is just genius and extremely hygienic. Unfortunately I don't like the actual product as much as I like the packaging. It's not that it has done any damage to my skin or anything of that sorts, but it just hasn't wowed me at all (I just don't get what all the fuss is about). It's also nowhere near as moisturising as I had imagined it would be, as I sometimes still manage to feel a tightness in my skin after applying it. As much as I wanted to like this, it just wasn't meant to be and although I'll be using it up, I won't be running back to the shops to buy a second one. Due to the fact that I'm still left with a slight dryness in certain areas of my face I also picked up the Vitamin E Overnight Serum-In-Oil from The Body Shop. I simply apply a few drops of this onto my fingertips and then pat it on the face (mostly my dry cheeks) and leave it to work it's magic overnight. Even though this is an oil it is super light and doesn't leave you looking like a grease ball (obviously not a look anyone would want to sport). Leaving this overnight will have you waking up to soft & smooth skin, which is a winner in my books. I have to say I am thoroughly impressed with The Body Shop Vitamin E range, for the price this stuff is pretty amazing. So that's my evening skin are done & dusted! Most nights I will also apply a lip balm as my lips tend to get quite dry, but that's another post on its own! What are your thoughts on my evening skincare routine? Do you currently use any of these products? I really want to try the Vitamin C serum and currently love the Micellar water and the Effaclar Duo! Now I want to try that cleansing water! How cool is that! Thanks for sharing! Great post! I really want to try the micellar cleansing water and the vitamin E serum now.